Anyone else a big fan of Trader Joe's? It has opened my eyes to a whole new world of treats. The Everything But the Bagel seasoning, the almond horns, the Thai veggie burgers. But the best of all? The frozen gnocchi dinners that are just so, so delicious. 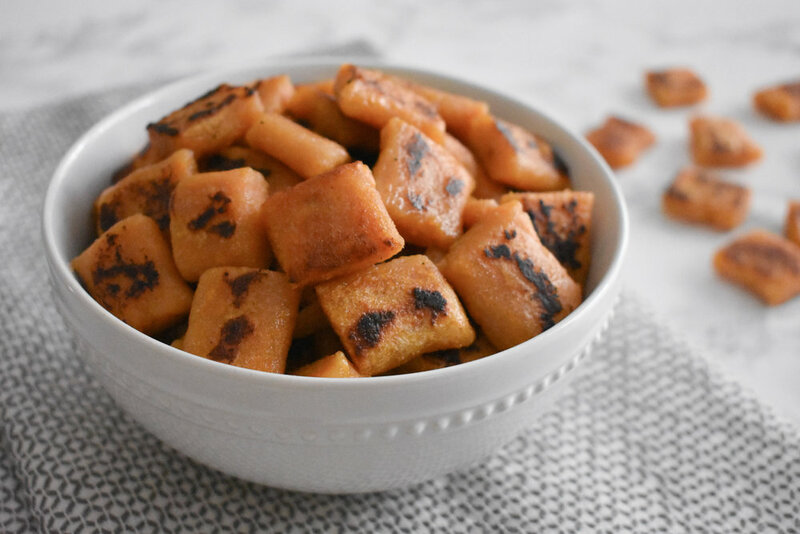 We went through a season in our house where I was consistently storing bags of the Trader Joe's gnocchi meals in our freezer for busy nights, which turned into every week meals. They're easy and addictive. I figured gnocchi had to be complicated to make (really I had no clue what really made gnocchi) so after some research, I realized gnocchi isn't that difficult AT ALL. It's definitely a few extra steps from buying the frozen meal, but this way you know exactly what is in them and they're just that much healthier. Preheat your oven to 425 degrees. Pierce your sweet potatoes three times each before placing on a foil lined baking sheet and putting in the oven. Bake for 45 minutes. Once your sweet potatoes have baked, allow them to cool enough to handle with your hands. Remove and discard the sweet potato skins. Place the sweet potato (which will resemble mashed sweet potatoes at this point) into a bowl with the 1 c. cassava flour. Mix until fully combined. Divide the sweet potato and flour mixture into four equal sections. Using cassava flour, dust your surface and roll one dough ball into a long rope about 1" in diameter. Using your hand, flatten the rope of dough before cutting 1" pieces of gnocchi. Set aside your gnocchi and repeat with the remaining 3 dough balls. Bring a large pot of water to a boil. Add the gnocchi and cook until the rise to the top. Remove the gnocchi, place on a paper towel on a plate to drain excess water and drizzle with olive oil*. Heat a large skillet and coat with oil. Brown your gnocchi on each side. Serve warm with toppings of your choice. *This detail is crucial. The gnocchi WILL stick together if you don't coat them with some oil.